We’ve all had that feeling on one Caribbean trip or another — “what if we don’t go back?” But this is one step further. Ever thought about becoming a hotelier? This is your chance! Conveniently located right in town across the street from the beach, within walking distance to Mini Market, Stores and Restaurants… A total of 17 rooms consisting of 14 rooms and 3 suites/apartments…. 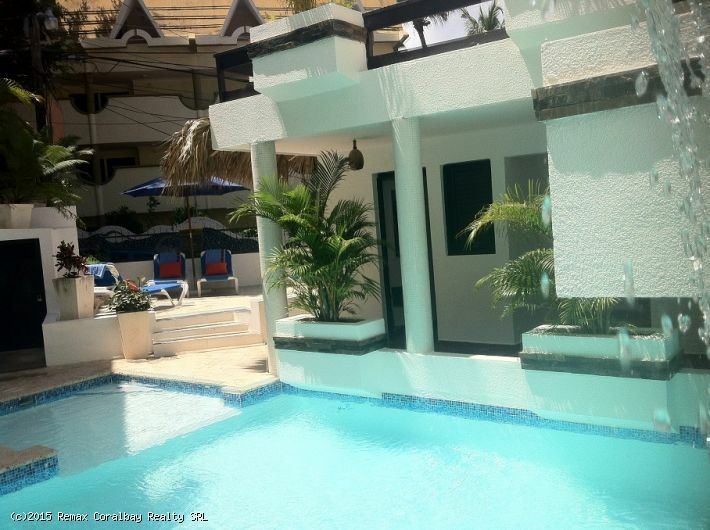 one kitchen, small restaurant/bar, swimming pool with two waterfalls and Coral patio deck, office, upper and lower sun decks,…. All new equipment, pool pump and filter, security camera system, gas hot water tanks, propane tanks, water pump system, new inverter air conditioning in some rooms, new ceiling fans, many new features and fixtures including furniture and mattresses…. READY TO ROLL FOR HIGH SEASON !!!! !